Everyone studies in different places and in different ways. There are different locations in HCC that students can study in. They just need to find the perfect spot to get their work done. Some study better in total silence, while others need some noise to get them through that essay. Some students prefer a library, while others prefer a cafe. Every student has their own ways of getting through those homework assignments. 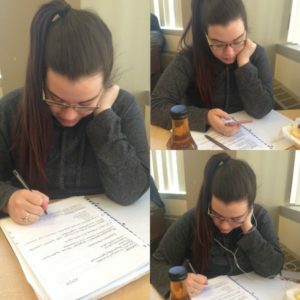 These are different ways that students study on a daily basis. Photo by Mary Carlson. There are so many students in the world that want to get their degree so they can move on to bigger and better things, but for them to do that they need to get their homework done and study hard. Many students struggle with getting their homework done. A lot of students fall in that category. Maybe it is because of where and how they study. A lot of students need a library or some place that is quiet to get my work done. “I need a quiet place to study in. That is why I go to the school library. I do go to the cafe at time, but I always end up talking to people and not doing my work.” says sophomore Kelley Figueroa. Many students work well when they listen to music, In fact, many students always have earbuds in while studying. Many cannot work well with people talking and moving about, but when it comes to music it is an easy task. A lot of students say it helps them study because it drowns out all the other noise if they have to be in a loud place. “I get distracted by silence as weird as it sounds thats why I listen to music when I study. It helps a lot” says sophomore Malinda Casanova. Students are also on their phones a lot and this is a distraction from getting their work done. Most of the students need peace and quiet to get their studies done, although there are some that can work with noise. They are used to it because their house it a loud one or their job is one with alot of noise so they tend to adjust to it. Many students study in the cafe and even though it can be loud I always see a lot of students there working. “Now I can study anywhere. It can be in a cafe with loud people or at home in silence. I work well when I have noise that is why I always find myself studying in the cafe. I don’t know why, but that is the way I study,.” says sophomore Doug Bragula. The library and the cafe are not the only places that HCC has to offer to do your studies. If you have ever walked around the campus, there are a couple levels to the school, and the higher you go the quieter it gets. “One day I was walking around school and I found myself on the third level of Beacon Hall. It was more quiet than all the other places in the school and it was easy to concentrate. Looks like I found my new study place,” says Oscar Mojito, Sophomore. Every student has their way of getting their work done. Every student has their place to get their work done whether it is in a cafe, library, or at home. Through silence or noise, students find their way to get an A. What are your ways to study or study habits? Let us know in the comments below!